Gelsenkirchen - FC Schalke 04 and Borussia Dortmund go head-to-head in the Bundesliga's 85th Ruhr district Klassiker on Matchday 6, the first season instalment of Germany's biggest and most intense local derby. A capacity 62,000 crowd will cram into Schalke's Veltins Arena on Saturday, some 20 miles up the road from Dortmund's own Signal Iduna Park, to see who, if anyone, will earn the local bragging rights for the next six months or so. Respectively third and second behind FC Bayern München in the final standings last season, neither side has exactly been setting the heather on fire over the opening weeks of the new campaign. On Wednesday Dortmund battled back from 2-0 down to salvage a point at home to VfB Stuttgart, a result that leaves them in eighth place in the table. The day before, Schalke had finally got off the mark at the fifth time of asking, finding their shooting boots in the second half to register a 3-0 win at SV Werder Bremen. That lifted the Royal Blues to within a couple of points of BVB, but sporting director Horst Heldt hit the nail on the head when he described the next task in hand as “a game where nobody's really the favourite, this one operates to its own rules.” The statistics appear to bear that out: despite their radically fluctuating fortunes over the years, Dortmund have edged just one more victory – 30 to 29 – in the two teams' 84 top-flight meetings to date. The ten most recent games, resulting in four wins apiece and two draws, further reflect that ongoing competitiveness. Both clubs can count themselves among the absolute elite of German football at the moment, but it was not always thus. BVB, by far the more successful in terms of silverware in recent decades, only rose to challenge Schalke's regional hegemony in the 1950s. 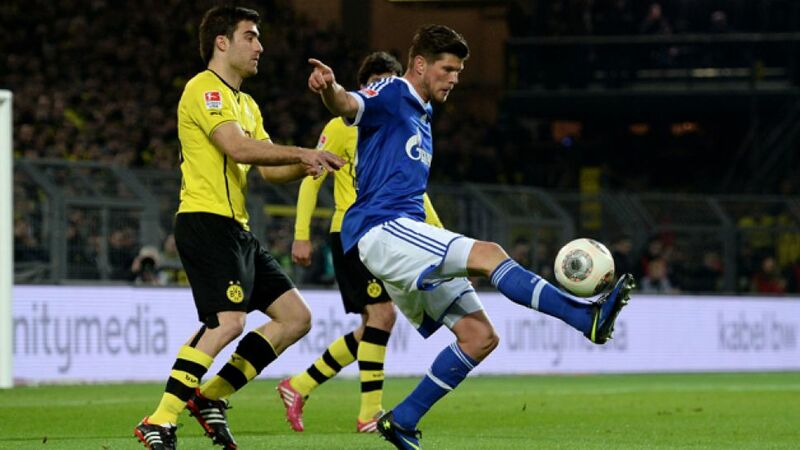 Each with their own massive fan base and a distinct but overlapping identity – Schalke's rooted in the local coal mining industry and Dortmund's in the steel production with which the city has long been synonymous – the rivalry swiftly intensified and as it did so, gained ever-wider recognition as the nation's definitive derby encounter. Perhaps the acid test of its local significance lies in the fact that, although the two Ruhr district heavyweights are once again battling it out for a place in the latter stages of the UEFA Champions League, for the hard-core fans on either side of the fence a victory over their arch-rivals trumps the lot every time and can salvage even an otherwise miserable campaign. That degree of fervour is not lost on the players themselves, a goodly proportion of whom are already battle-hardened derby veterans by the time they turn professional, having progressed through the youth ranks at either club. Schalke skipper Benedikt Höwedes is one such player, recalling playing to highly-animated crowds of several thousand at Under-19 level in games that “were always a bit out of the ordinary.” Currently sidelined with a groin problem, Höwedes is just one of a slew of Royal Blues stars either likely or certain to miss the game due to injury or, in the case of Julian Draxler, suspension. Another homegrown attacking midfield talent, Max Meyer, was meanwhile among the scorers at Bremen and stressed afterwards that the team needed to “make sure the points stay at home” on Saturday. That said, the late fightback against VfB demonstrated yet again that there is nothing wrong with team morale in the Borussia camp, with Klopp himself describing the final outcome as “a 2-2 win.” The goals from Pierre-Emerick Aubameyang and Ciro Immobile – the first in the Bundesliga for last season's Serie A top scorer – were a salient reminder of Dortmund's ever-present scoring threat. Returning hero Shinji Kagawa would doubtless have little objection to a repeat of his first experience of the Veltins Arena almost exactly four years ago. “We'll win and I'll score two goals,” the then little-known midfielder said with a smile in the run-up to his derby debut. Dortmund won 3-1 and Kagawa scored twice, instantly cementing his status as a cult hero with the fans. On Saturday, he could well find compatriot Atsuto Uchida blocking his path to goal. Sidelined for more than seven months, the dynamic full-back returned to the fray at Bremen and was, in Horst Heldt's view, “the outstanding figure on the pitch.” The Japanese sub-plot just serves to add one more dash of spice to this unique Bundesliga encounter.